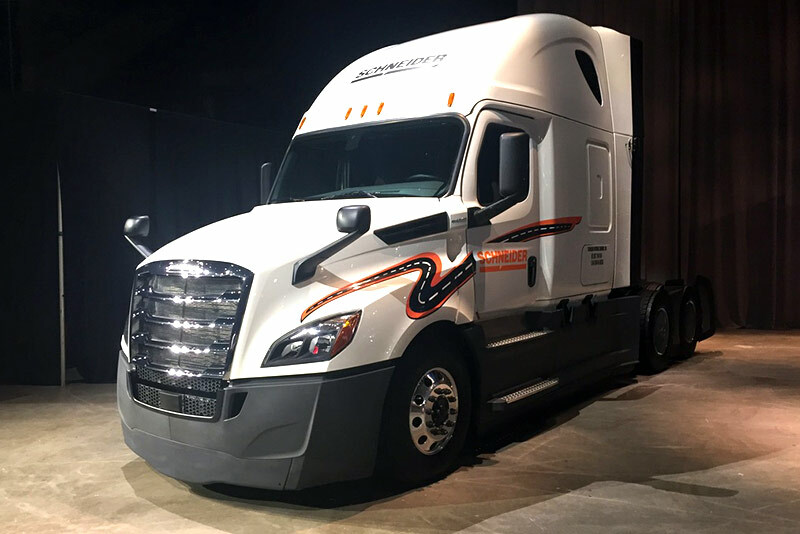 Daimler Trucks unveiled the latest model of its Freightliner Cascadia semi-truck Thursday, the first full redesign of the trucking industry workhorse since its introduction in 2007. The 2018 model, which will go into production early next year, features a new sleek aerodynamic design with a sloped body and one-piece windshield. The new Cascadia offers a host of improvements, said Martin Daum, chief executive of Daimler Trucks North America, including up to an 8 percent gain in fuel efficiency over the current model, advanced connectivity that allows trucking companies to monitor their vehicles around the clock, over-the-air updates and the type of advanced safety features that are becoming common in passenger cars. “This is the new frontier when it comes to fuel efficiency and there are still improvements to come,” Daum said. The big rig offers a new look on both the outside and the inside. Daum said Daimler paid particular attention to improving the cabin by providing more comfortable seats, a redesigned living space for long-haul truckers and by adding an automated manual transmission to make the vehicle easier to drive. A new front suspension provides a smoother ride. The new truck is powered by Daimler’s Detroit brand diesel engine. It has 400 horsepower and 1,750 pound-feet of torque. “We wanted to have the truck of choice for the big fleets of North America,” Daum said. He said the improvements could help trucking companies more easily retain drivers. Trucker turnover is a major industry issue. The redesigned cabin is quieter, thanks to improved door seals to reduce interior noise. Drivers will get more creature comforts. One configuration comes with a two-seat dinette, a Murphy-style bed, ambient LED lighting and multiple power options for electronic devices. There’s a larger mounting area to handle a 26-inch flat screen TV and bigger storage and appliance options. “Being 10 days on the road, sleeping in a truck cab – it is brutal,” Daum said. The biggest fuel efficiency gains will come with the optional Aero and AeroX packages, Daum said. The provide additional aerodynamic features to manage airflow, including longer side extenders, lower chassis fairings, drive wheel covers and newly-designed wheel fairings. 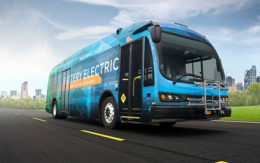 The new connectivity system offers a “virtual technician” remote diagnostic service and analytic tools that provide data on fuel efficiency and safety performance. It enables over-the-air engine parameter programming and remote engine and other powertrain electronic controller updates. “The biggest electronic device on the road will be the Freightliner truck,” said Richard Howard, Daimler’s vice president of sales and marketing. Daimler executives said the company’s North American operations depend upon the adoption of the truck by the big carriers. The business is heavily concentrated among just 12 trucking firms, which have spent a combined $9 billion purchasing Freightliner trucks since 2011. But Daimler also sells the truck to many smaller carriers. Freightliner, and Daimler’s smaller Western Star brand, have about 42 percent of the U.S. market in the heaviest Class 8 truck segment, according to Wards Retail Marketshare, an industry research firm. Paccar is second at 27 percent. Vieth compared the redesign of the Cascadia to when Navistar came out with its Prostar in 2008. Following a preview of the new truck earlier this week, the big carriers said they were ready to sign large contracts. Moyes said the active safety features such as collision avoidance with automatic braking, lane departure warning and blind spot monitoring are important selling points. Trucks equipped with those features are logging fewer crashes, and when they do have collisions, the impacts are less severe, Moyes said. Moyes said he plans to purchase about 2,500 of the new Cascadias next year, spending about $300 million. David Congdon, chief executive of Thomasville, N.C.-based Old Dominion Freight Line, also liked the new Cascadia. “To find a truck of this quality and comfort is amazing,” said Congdon, a former truck driver. He said Old Dominion plans to purchase 1,000 of the semi-trucks, which he estimated to be a $100 million tab. Daimler plans to continue to produce the existing Cascada for another two years as it ramps up production of the new model next year, Daum said.